We looked at this €12 billion claim when it was first made. The starting point for it is data from the US Bureau of Economic Analysis and, in particular, this release on the foreign activities of US Corporations. The very first page shows a “net income” figure of $95.575 billion in the row marked “Ireland”. And 12.5 percent of $96 billion is $12 billion (we will ignore the fact that the Revenue Commissioners collect tax in euro rather than dollars). But just because the US Bureau of Economic Analysis labels these earnings as “Irish” does not mean they are in Ireland. There are “Irish” people living in close to every country in the world. The details behind the BEA statistics can be found in this methodology with page 12 giving the definitions used for their “Classification by Country”. A quick read will show that place of incorporation is one of the key determinants used when the BEA decide the location of foreign affiliates of US MNCs. Can we find this $96 billion of net income in Ireland? Let’s see. First, lets try the Revenue Commissioners. Even if the profit is being taxed at a very low rate if should still show up in the the total amount of “net taxable income/profits” in Ireland. In 2010 (the same year as the BEA figures) “net taxable income” was €40.2 billion. See the very last figure in this release. That is €40.2 billion for ALL companies in Ireland. So foreign-owned enterprises generated around €44 billion of Gross Value Added (GVA). To get Gross Operated Surplus (GOS) remuneration of employees would have to be subtracted (257,000 times say €40,000 is a little over €10 billion). That gives around €34 billion of Gross Operating Surplus for ALL foreign-owned companies in Ireland. “Gross Operating Surplus” as recorded by the CSO is a different measure, though somewhat similar in principle, to “Net Income” reported to the Revenue Commissioners. The point is simply that nothing in Ireland gets us close to the $96 billion income figure reported by the BEA. In 2010, equity investment in Ireland (ownership of companies) by foreign nationals had earnings of €36.1 billion. Again this is for ALL foreign nationals not just US MNCs. If an operation or activity is incorporated abroad—as most are—it is always considered a foreign affiliate. [.] if a business en­terprise that is incorporated abroad by a U.S. person conducts its operations from, and has all of its physical assets in, the United States, it is treated as an incorpo­rated foreign affiliate in the country of incorporation, even though it has no operations or physical assets there. This treatment ensures that the foreign entity is reported to BEA. Take AOI. AOI has no owner but Apple. AOI has no physical presence at any address. In thirty years of existence, AOI has never had any employees. AOI’s general ledger, its major accounting record, is maintained at Apple’s U.S. shared service center in Austin, Texas. AOI’s finances are managed by Braeburn Capital, an Apple Inc. subsidiary in Nevada. Its assets are held in a bank account in New York. AOI’s board minutes show that its board of directors consists of two Apple Inc. employees who live in California and one Irish employee of Apple Distribution International, an Irish company that AOI itself owns. Over the last six years, from May 2006 through the end of 2012, AOI held 33 board meetings, 32 of which took place in Cupertino, California. AOI’s lone Irish-resident director participated in just 7 of those meetings, six by telephone, and in none of the 18 board meetings between September 2006 and August 2012. ASI’s circumstances are similar. Prior to 2012, ASI, like AOI, had no employees and carried out its operations through the action of a U.S.-based board of directors, most of whom were Apple Inc. employees in California. Of ASI’s 33 board meetings from May 2006 to March 2012, all 33 took place in Cupertino. According to the Senate report, Apple Sales International (ASI) reported pre-tax earnings in 2010 of $12 billion. As the statement from Sen. Levin makes clear ASI carries out all its activities in the US. In the BEA statistics this income is attributed to Ireland because AOI is an Irish incorporated company. These companies are not resident in Ireland for either Revenue or CSO purposes or any purposes. The McWilliams article asks “where do you think enormous amounts of US multinational money is on deposit? Yes, you guessed right, in the deposit accounts of the big US banks in the IFSC.” Well, in the case of Apple that is plain wrong. In its submissions to the US Senate Apple was clear that its “foreign” cash is “held in a bank account in New York” and “managed by Braeburn Capital, an Apple Inc. subsidiary in Nevada.” There is no evidence that the money ever even passed through Ireland. The structures of other US companies provide similar conclusions. Companies such as Google and Microsoft have large sales operations in Ireland but these operation do not report very large profits. Why? Because they pay patent royalties for the rights to use their parent company’s intellectual property. Ireland is a low-tax country for corporations but it is not low-tax enough for them to shift the economic rights of their intellectual property here and it is to the IP that most of the profit is attributed. Here is a chart from the CSO’s Balance of Payments on patent royalty flows in and out of Ireland. What does it show us? There are massive outflows of royalty payments (€28 billion in 2010) and much smaller inflows (€2 billion in 2010). There have been efforts in recent Finance Acts to make Ireland more attractive for holding companies but the effect is small compared to the outflows of royalty payments. The outflows hugely reduce the profitability in Ireland of the MNCs operating here. Where does this money flow to? Much of it flows to small island nations like Bermuda and the Cayman Islands. Google book massive advertising revenues in Ireland but the profit is attributed to intellectual property that is held in Bermuda. The holding company, Google Ireland Holdings is Irish incorporated but the royalty payments made to it are outflows in the Balance of Payments and the profit is not taxable in Ireland. Microsoft’s Round Island One is also resident in Bermuda though Irish incorporated. In recording massive sales for US MNCs in Ireland the BEA is correct. These are also evident in the CSO data. However, the profit from these sales is shifted out of Ireland in the form of patent royalty payments. The BEA attribute these profits to Ireland as the holding companies are Irish incorporated. The Apple holding companies are currently tax resident no where and thus pay no corporation tax. (Last month’s Budget announced that such a structure using Ireland will no longer be possible from the start of 2015). Google, Microsoft and other companies are their holding companies, and profits, in Bermuda (the rate of corporation tax in Bermuda is zero). Companies should not be able to claim “stateless income” and curbs have to be put in place on their ability to shift profits to no-tax jurisdictions. This is one of the goals of the OECD’s BEPS initiative but it is far from clear that anything substantive will be achieved. In 2009, US companies paid 43% of all Corporation Tax paid in Ireland. Multinationals in Ireland do not pay 12.5 per cent; they pay on average 2.5 per cent tax on profits. This is a joke and the joke is on you because that which they don’t pay, you do. The gain to Ireland would be huge. The budget deficit would be eliminated immediately and the country would run a surplus. According to Keith Walsh, US companies contribute close to €5 billion to Ireland’s total tax take. Next year Exchequer tax revenue will be around €40 billion. Now that is really 12.5 percent. Here is a slide from a presentation used this morning by Olli Rehn when introducing the Commission’s Autumn 2013 Economic Forecast. The north/south divide is strong with this one. Yesterday, the Department of Finance published the first in a new set of monthly mortgage arrears and restructures figures. Hopefully, the series will be expanded because the first issue contains almost nothing that is new and also has some errors. However, the number of units with a mortgage is not the same as the number of mortgage accounts. A separate measure in the Census showed that of the 1.65 million units occupied by the usual residents that just over 580,000 were owner-occupiers with a mortgage. The 699,674 used in the DoF release would only be appropriate if the relation between mortgage accounts and houses was 1:1. It is not. There are many household who have more than one mortgage account on the principal dwelling house (PHD). This can be because of top-ups, remortgages or splitting a mortgage between different interest rate types. Previous work by the Central Bank has shown that the ratio of mortgage accounts to PDHs is around 1.27:1. Therefore the 699,674 mortgage accounts in the MART corresponds to roughly 550,000 houses/households. This means 27.6% of houses in Ireland have “mortgages covered under MART” not 35%. The figures on mortgage restructures add little to what is already known from the quarterly figures published by the Financial Regulators office. There is a breakdown of “permanent” versus “temporary” but this is broadly known from the type of restructure used. It would be useful if this breakdown was further distilled into those accounts which are in arrears and those accounts which are not. It would be even more useful if the success rates of the restructures were published, i.e. whether the borrowers are meeting the terms of the restructures. The figures from the FR indicate that 76% of the restructures are being adhered to but we do not know which restructures this applies to. 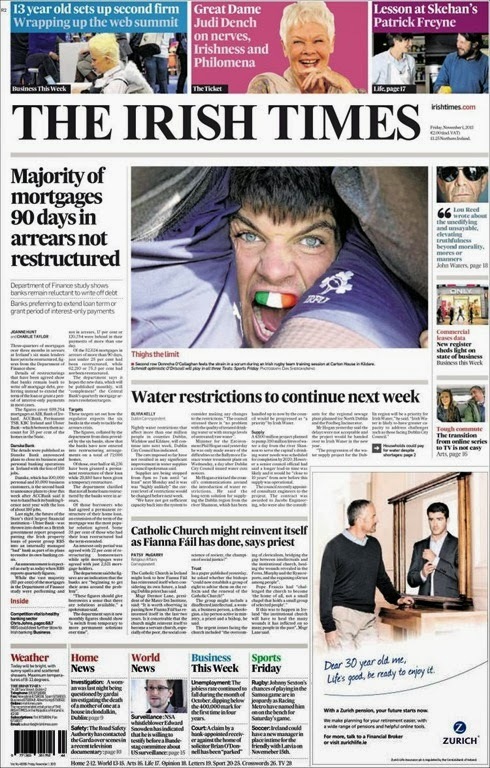 The fact the 75% of mortgages in 90 day arrears or more have not been restructured is not news but it did make the front pages of today’s Irish Examiner (image) and The Irish Times (image). Three-quarters of mortgages over three months in arrears at Ireland’s six main lenders have yet to be restructured, figures from the Department of Finance show. Three in four home loans in long-term arrears are not being restructured by the banks despite lenders having a range of mortgage solutions to offer borrowers. The data shows 62,210 of these long-term arrears mortgages were not restructured, while solutions were agreed for just 20,424 loans. It is very unlikely that all loans in arrears will, or even can, be restructured. It is possible that a borrower who has historical arrears may now be back “on track” and hence a restructuring is unnecessary. This highlights another shortcoming with the arrears data – they do not tell us whether a borrower is accumulating arrears now. A measure of the number of accounts in arrears now, or even better, a measure of the number that are currently covering the interest on their loans would be very very useful. It is also the case that there are many loans where a restructuring is just not possible. For example, Ulster Bank have said that 35% of their customers who are in 90 day arrears are either not engaging or are not paying anything towards their mortgage. It is nearly impossible to put a restructure in place in such circumstances. It is also worth noting that a further 50,672 mortgages which are not in arrears have also been restructured. This could be because any arrears has been repaid or recapitalised or because the restructure stopped the mortgage falling into arrears in the first place. In total 71,086 mortgages in the sample have been restructured which is a lot of activity. Finally, the data in this release represents 90% of all mortgage accounts in Ireland. In this sample, 82,824 out 699,674 accounts were in 90 day arrears at the end of August. That is 11.7% of mortgage accounts in the sample. The most recent data from the FR for the entire mortgage market is for the end of June. At that time, 12.7% of all mortgage accounts were in arrears of 90 days or more. That means the tenth of mortgages that are in institutions outside the MART process have an arrears rate of 21.5% – nearly double the rate of arrears of those in the DoF sample. The lenders here include INBS, BoSI, Start, Danske and although they are smaller than the other lenders in proportionate terms their arrears rates are far worse.